Me & Harry started our day by going up The Tower. It was a busy 1/2 term day and I thought we would get stuck queuing for ages but I was pleasantly surprised by how quick we got through to the 4D Cinema Experience which is the first stop before you take the lifts up The Tower. We were provided with some very funky 4D glasses and watched the 10-minute film that takes you through the history of The Tower & Blackpool.I have seen 4D shows at Disney and I do have to say this was as enjoyable as one of Walt’s creations. We then headed over to the lift to go up the Tower. Going up in the lift and looking out over Blackpool was a truly exciting experience. Once we reached the top we walked straight over to the Sky Walk made from 5cm thick glass to take a look down on Blackpool from 380ft. I’m not going to lie, both of us took one look down and refused to stand on the Sky Walk, preferring to stand on the edge of it and have a peek down. I know that we shouldn’t show fear around our children but I couldn’t hide my panicked expression of putting a single foot on the Sky Walk. Instead, we decided to climb as high as we could up The Tower and looked out onto the clear blue horizon. It does get quite windy at the top of The Tower even on a nice day so make sure to take a jumper with you. Just before grabbing the lift back down we found one of those machines that squish pennies and stamps designs on them so this was to be our 1st souvenir of the day. This was quickly followed in the gift shop by a photo of us sat on an iron girder and a snow globe of the Blackpool skyline. I’m a sucker for a souvenir. We had an hour to kill before the Circus so we thought we would eat at the Harry Ramsden’s located on the 2nd floor. There is no easy way of saying this but it wasn’t a nice experience. The service was very slow, they overcharged us ( which they did rectify ) and the food wasn’t very nice. It was over cooked and cold, but as we had already waited over 20 minutes for the food to come we nibbled at it and decided we would buy something in the Circus. To be fair to Blackpool Tower this is a franchise so they can’t be blamed for the quality but if you want a quick bite to eat I would suggest the coffee shop on the same floor that does some lovely looking sandwiches and cakes. Not to let this dampen our day we headed to the bright lights of The Tower Circus and grabbed the largest bag of popcorn we could find. We found some great seats in the stalls and waited for the show to begin. Harry didn’t want to have a go but before the show begins they welcome children to go into the Circus ring and teach them juggling & plate spinning. It’s a lovely atmosphere in the Circus and we were very much looking forward to the show. The Tower Circus is what you would expect from a traditional Circus with acrobats, dancing and of course the world-famous Mooky & Mr Boo, who I have to say made the show.It’s a very well put together performance, extremely entertaining and there were plenty of variety between the different acts. Mooky & Mr Boo provided the comedy element and even through their act was aimed at the children the adults were laughing as loudly as the little ones. I have taken Harry to a couple of the travelling Circus’ that set up on the outskirts of Blackpool and The Tower Circus was 100 times better and more enjoyable. After we had finished at The Tower & Circus we were gifted with a pair of tickets for the Sea Life Centre which we accepted and popped over for an hour. We have been several times before and it’s guaranteed fun.My favourite area is rock pools where you can touch the Starfish and handle the mini crabs ( just watch out for their claws) and Harry loves sharks so we spent a lot of time in the viewing tunnel watching them swim over our heads.The Sea Life Centre is well designed and all the tanks were at Harry’s eye level so there was no need for holding him up to look at the fish.The staff are always friendly and full of knowledge which is handy when you have a son who never stops asking questions. We spent about an hour looking around and then capped our day off with 20 minutes in the soft play area next to the gift shop.Sadly the gift shop didn’t sell anything stronger than a coffee because by this point I was in need of a glass of wine & a foot rub !! Our day was action packed and I loved every minute of having some quality 1-1 time with Harry. I’m glad I waited for Harry to be a bit older before we went to The Tower & Circus as he was able to appreciate the day more than if he had been 2 or 3. I would definitely take Charley when she was a bit older but I am glad that on this occasion she was enjoying a day at nursery. Price wise our tickets for The Blackpool Tower Eye, Circus & Sea Life Centre cost £31 for me & £26.50 for Harry. 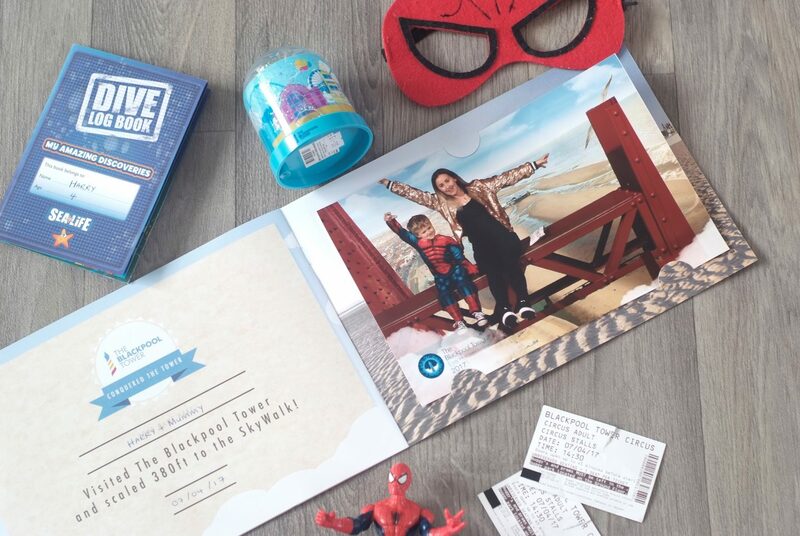 They do offer the Blackpool Big Ticket that includes all the attractions within The Tower & Sea Life Centre for £45 per adult & 32.50 per children ( under 3’s are £8.95 ) if you were wanting to do this I would suggest making a full day of it and getting there early as there is a lot to see. Scores on the door for our day would be an 8.5/10. The food was unfortunate but not bad enough to spoil our day. I would defiantly take Harry back to the Circus as it was so enjoyable.The Blackpool Tower Eye was fun but once you have done it, you don’t need to do it again and the Sea Life Centre is an attraction you can never get bored with so we will be back their time after time. We had a wonderful day together so thank you to Blackpool Tower for inviting us and it’s a big thumb up from both of us. Here’s a quick video of our day at Blackpool Tower. Take a look at the fun we had ……..
"POSTS FROM THE HEART #16"
"The Need For More – How Do You Change Your Life When You Don’t Know Whats Wrong ?"